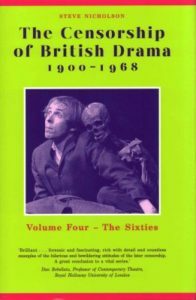 Last year’s best book about British theatre, according to the judges of the 2015 STR Theatre Book Prize, was a fascinating study based on the files from the Lord Chamberlain’s Office now held in the British Library. 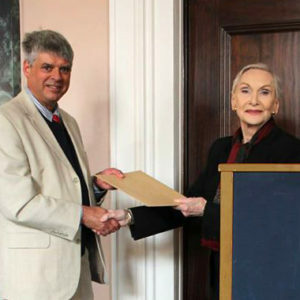 At a gathering of people from the theatre and the book world held in the historic rooms of the Theatre Royal Drury Lane, distinguished actress Dame Siân Phillips presented the prize to Steve Nicholson for The Censorship of British Drama 1900-1968 (University of Exeter Press). Author Nicholson, who is Professor in Twentieth Century and Contemporary Theatre at the University of Sheffield, wins after being short-listed for this prize in previous years. Formerly a founder member of White Horse Travelling Theatre he claims his performance as the donkey in Ali Baba and the Four Tea Thieves is still remembered fondly by many who attended primary schools in Somerset in the late 1970s. Sam Walters, theatre director, founder and until recently artistic director of the Orange Tree Theatre, Richmond. Sarah Hemming, theatre critic for the Financial Times. Colin Chambers, Professor Emeritus Kingston University, formerly Literary Manager at the Royal Shakespeare Company and author among many books of the winner of the first Theatre Book Prize, awarded in 1997 for his The Life of Margaret Ramsay, Play Agent. Howard Barker’s Theatre: Wrestling with Catastrophe edited by James Reynolds and Andy W. Smith (Bloomsbury) ‘Sticks,’ as judge Sarah Hemming remarked, ‘to just one writer, offering a rich and engaging reassessment of this original and influential dramatist. It draws on experience and opinion from practitioners, academics and critics to explore and evaluate Barker’s methods, aesthetic concerns and significance.